The authors are Jerry Patterson and Eric Nielsen. If you are looking for a well written book on the gambling, you are on the right way. The authors did their best to make such kind of the book. It is both good read for the amateur and the professional player (possibly, even the pros can find something useful for them). The book has quite fresh info on the gambling activities. What is worth mentioning is the bankroll management. It is the best gambling strategy ever, as it works for any gambling activity in all the times in all the countries. Before even thinking about entering the casino, you should consider your money management and the book shows how you can learn it. What else is good is that one of the chapters in the book is devoted to the mental preparation, as gambling is not for cowards. When you go to the casino, you should always remember that you can lose everything you brought with you. The person needs to be prepared for that. Losing money demands strong will. The authors are covering the gambling games like roulette, craps, casino poker, blackjack, and baccarat. Among the advantages we can emphasize on the chapter division, where you can easily find the exact information you are looking for. But at the same time it would be good if the authors had a classification of the groups of the games, so that the readers would not turn the pages in vain. When they talk about a specific game, in our case we are more interested in the roulette, they go from the history of the game until nowadays. A little insight for the gamblers makes the game understanding a bit easier and it is just a good addition to the round development of the person. 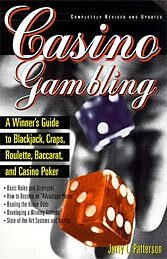 As any other book on the gambling games, this one covers the main strategies of the games. The most famous and legal one is finding a biased wheel and taking advantage of it. Also there is a notion called "dealer's signature" and how you can recognize it. Also the authors cover the strategies with negative and positive progressions. And what is more, they talk about the recreational players, for whom gaming is fun, not a profession or addiction.